There are a number of insects and diseases that attack hardwood trees. Some are very specific to black walnut trees. A good source for problems specific to black walnut is the publication "How to Diagnose Black Walnut Damage," USDA Forest Service General Technical Report NC-57. 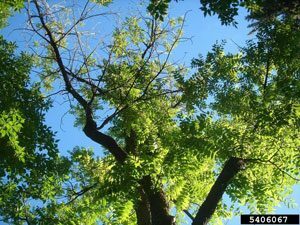 "How to Identify and Control Leaf Spot Diseases of Black Walnut" has information on anthracnose, bull's-eye leaf spot, and white mold. The website www.forestpests.org tracks the latest information and has numerous publications. The US Forest Service publishes pest alerts on a variety of pests. A beetle from Asia, Agrilus planipennis Fairmaire (Coleoptera: Buprestidae), was identified in July 2002 as the cause of widespread ash (Fraxinus spp.) tree decline and mortality in southeastern Michigan and Windsor, Ontario, Canada. Larval feeding in the tissue between the bark and sapwood disrupts transport of nutrients and water in a tree, eventually causing branches and the entire tree to die. Tens of millions of ash trees in forest, rural, and urban areas have already been killed or are heavily infested by this pest. A phenomenon known as Sudden Oak Death was first reported in 1995 in central coastal California. Since then, tens of thousands of tanoaks, coast live oaks, and California black oaks have been killed by a newly identified fungus, Phytophthora ramorum. On these hosts, the fungus causes a bleeding canker on the stem. The pathogen also causes leaf spot and twig dieback on a variety of species of less importance than the oaks. As of January 2002, the disease was known to occur only in California and southwestern Oregon; however, transporting infected hosts may spread the disease. The pathogen has the potential to infect oaks and other trees and shrubs elsewhere in the United States. Limited tests show that many oaks are susceptible to the fungus, including northern red oak and pin oak, which are highly susceptible. The gypsy moth has been an important pest of hardwoods in the Northeastern United States since its introduction in 1869. Established populations exist in all or parts of 19 states from Maine to Wisconsin and south to Illinois and generally in a southeasterly line from Illinois to northeastern North Carolina. Oaks are the preferred host species for feeding caterpillars, but apple, sweetgum, basswood, gray and white birch, poplar, willow and many others serve as hosts. The Asian longhorned beetle (ALB) has been discovered attacking trees in the United States. Tunneling by beetle larvae girdles tree stems and branches. Repeated attacks lead to dieback of the tree crown and, eventually, death of the tree. The beetle prefers maple species (Acer spp. ), including boxelder, Norway, red, silver, and sugar maples. Other preferred hosts are birches, Ohio buckeye, elms, horsechestnut, and willows. Butternut canker is caused by a fungus known as Sirococcus clavigignenti-juglandacearum which is killing butternut (Juglans cinerea) throughout its range in North America. Butternut is closely related to black walnut (Juglans nigra), which is not naturally susceptible to the disease. DED is one of the most destructive shade tree diseases that affect elm trees. The disease kills individual branches and eventually the entire tree within one to several years. A fungus and an insect are responsible for DED development. The fungus was introduced to the United States on diseased logs from Europe in the 1930's.